So working on the basis that you accept that you are unique and bring something very much your own to the world, now it is time to look at what your strengths actually are. Many people find it helpful to jot down their ideas so that they can look back on them over the coming weeks. Most importantly really be aware of your first thoughts after each question. Don’t filter out anything for an answer you find more acceptable. There is no right and wrong or good or bad when exploring your inner world. So here we are not looking for what you want to be or what you are not, but what you already are. Write a list of your strengths including at least four of them. Once you have this list there are some points for you to consider. How easy is it for you to list the things you bring to the world? If it was difficult or made you uncomfortable then it is worth stopping to explore what is going on. If we are not used to thinking of ourselves in positive terms this can be really hard to do. It can even feel threatening to suggest that there is good in ourselves. It may feel like we don’t deserve it or we can fear other people disagreeing. However, everyone has talents and strengths wether we recognise them in ourselves or not. It is just that, if we do allow ourselves to acknowledge our strengths, we can make more use of them. If you are stuck, begin to think of other people in your life and what they value in you. Maybe you are a good friend, or someone to laugh with or a good listener. Maybe you are quick witted or can always see the funny side of life. Which are the hardest characteristics for you to acknowledge in yourself? These are the strengths we have, but find difficult, because it contradicts some other belief about ourselves. They are the ones that we need to work on incorporating as a part of our self image. I will use myself here to explain. For me listing ‘Intelligent’ was the least comfortable thing for me to put it in my list. I always believed intelligence was about academic prowess. Those who could recall facts and remember details were the clever people and I can’t do that. Over the years I have learnt about the different types of intelligence and understood that I am actually clever. However, it is still the least comfortable thing for me to say about myself because clearly I have not fully accepted the truth of it. I am excited about the prospect of this changing because I know from long experience that when it does it will open up things as yet unknown in my life. Were there any strengths you thought of but excluded because it felt too uncomfortable? These are the strengths we have that really challenge us. So once again, using me as an example, going back 20 years ‘intelligence’ just would not have made my list. I would have thought it but then excluded it. However, during that time, having acknowledged the truth, I have utilised that part of myself much more fully than when I denied it. Even if you found listing your strengths easy this above question is for you too. Finding it easy signifies that you are comfortable with having strengths. But look a little further and push yourself to think about what could be on your list but you excluded or wouldn’t put there? We often put skills outside and beyond ourselves that we actually possess. I’d say my some of my best attributes are my intelligence, my fighter spirit (I don’t give up easily), I’m a good listener, I’m analytical and logical, I’m introspective (I consider that a strength), I am able to see both sides of an opinion, belief, story. I’d say the last one is the hardest one for me because while it is a strength that I have I also see it as a curse sometimes because people wanting my opinion on something or when I hear someone else’s point of view and it makes more sense to me so then I agree and adapt; this makes me seem and feel a little flaky, like I can’t really make up my own mind. Logically, I know that’s not true yet I still see this in myself at times, especially when it comes to politics or religion. Hi Michelle, This is where self value comes in and it is not always easy. 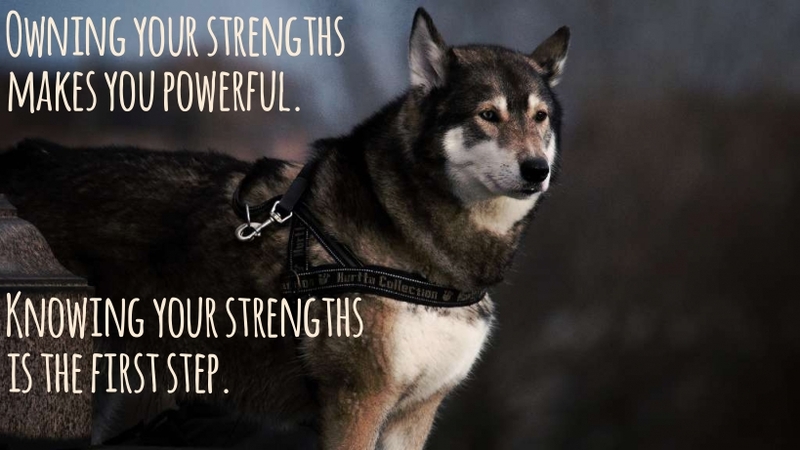 The strengths we have may not always feel like strengths. Someone who is quiet will get great benefit from it at times but at others the may wish they were more expressive. Thank you! Next time I start to doubt myself when seeing both sides of an issue, I will think of your words of wisdom. Lovely post honey! Truly inspiring! I can’t believe that you would ever doubt your intelligence. Your posts are so full of knowledge and flow so well. My two personality traits that contradict would have to be I believe to be witty but suffer from battles with depression. It’s something I have a tendency to try and hide about myself. Thanks for linking another great post with #momsterslink. We all have contradictions within us Trista and that is okay. You certainly are witty and you have a way of looking at things that is uniquely your own and funny. The more you incorporate within yourself the better it is, if that makes sense. Like me not acknowledging intelligence even though it was within me, it can be hard to see some things within ourselves because of our emotional training but it is far better that I do acknowledge it. I am just talking from a personal viewpoint but I am feeling from what you have said that there are strengths and abilities within you that you have not even touched on yet. Does that sound possible? Is it scary or exciting? There is some great exercises in a week or two that I think will be useful for you. Have a great weekend Trista. Sometimes my own strengths surprise me. Like my ability to stay calm when there is a serious crisis going on around me. I always thought I would be the one running around like a chicken with my head cut off…but I’m surprisingly calm. Hi Kathleen, Listing traits and emotions as positive and negative is not very useful. Like you said there is the being a woman and what is expected from us which can, if we allow, it limit our ability to be ourselves. Likewise feelings that are happy are not the only ones we need. All of you is valid and can be used if you embrace them. There are things within us that are markers that we are not being ourselves, a discord within, but this is of use too. For example a quiet person may be naturally that way and comfortable with it. However another person may be quiet because they have been taught to be wary of sharing their views and so this behaviour is limiting them. Although again once this is acknowledged this person can use that life experience as a strength. Thanks for letting me know. This is not about singing your own praises but just about acknowledging your strengths so that you can fully utilise them. We are often taught to focus on what we don’t have in life but that limits us. Of course we need to learn and grow but only noticing what is not there is not as helpful as seeing both. For example if we want to create something then it is no use focussing on what we don’t have but instead we need to work with what we do have and the first step is to identify the raw materials then we can actually begin building. This is great stuff Kirsten, in the last few years the encouragement to focus on my strengths rather than my weaker areas has transformed my life. I personally found the Strengths Finder approach such a helpful way to articulate the key areas that make me tick – and once I’d articulated them it was so much easier to embrace them. Love the idea of the Self Worth Challenge! Keep up the great work! Absolutely. when we have a strength it doesn’t take away from anyone else’s and it is not saying that we are better than anyone else. It is just about acknowledging what is so that we can utilise our talents fully. Thanks so much for commenting. Week four already?! Where has the time gone! This is really good thought provoking stuff, thank you. Um, still pondering what mine are! Thanks For letting me know Debbie. I hate having to think about my strengths but…I think I’m intelligent, compassionate, and have a good sense of humour. I used to think I was patient but since having children I’m not so sure! Hi Lady Nym. It is great that you have decided on some strengths even though you hate it. Those are all great skills you mention are fantastic. I think that for many of us actually having kids calls in to question the patience level that we expected to have. The fact that you hate thinking about your strengths is going to have an impact on your life in some way. It makes me wonder where you received those messages from and if you really believe it is not good to acknowledge your own talents? It is not that I am being nosey and I don’t need to know your answers to this (unless you want to) but it would be lovely to think that you could become more comfortable with you skills and fully acknowledge them with time. Actually in week 6 we return to the topic again from another angle which will be good. Thanks for sharing and well done. Great idea to take the time to look inside and ‘analyse’ ourselves for the better! Awesome post! I think it is hard to list things about ourselves that are good. We always look to the negative so easily that it is hard to go the other way. I try to lean more toward the positive in all I do. Thanks for linking up with #Alittlebitofeverything! Have a great night! I think if I couldn’t look at the positive things, I would not get along in life too well. I wish the world could see it like that. You’re right, it can be challenging to think of the positives in ourselves. We’re quick to put ourselves down but not so quick to admire. You’ve shared some great and challenging thoughts here. Another great post and is something I try and do regularly despite my feelings. Are all these posts series linked, of so could you drop me a tweet with the series link, would loved to back read and go through them all. Thank for linking up with us on the #bigfatlinky hope to see you there this week. Harps recently posted…UDI Gluten Free Hamper Giveaway! Okay so I am glad you have your traits list and I love the passionate and caring parts. But I would love for you to push it a bit further and ask yourself what is the upside of being short tempered or what does it give you? Almost every trait can be seen in a positive or negative light. For example someone who is quiet could see it as a bad thing but it actually allows them to listen and reflect on things that others would n’t stop to do. With being short tempered it might give you something or it might be that there is something behind it that is beneficial. Let me know if you have any questions.